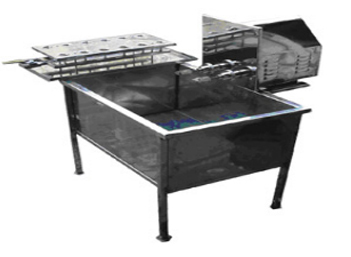 semi automatic bottle brushing and washing/rinsing machine is suitable for all kinds of bottles, vials, jars etc. It consists of following units. brushing unit: available in 2 or 4 heads. Have ss covered body and robust construction. Rotating chucks are provided to hold the brushes of suitable size for brushing the bottles. rinsing unit: each unit is made out of ss304, consists of 12 ss rinsers. Valve is provided for controlling flow of water. Leak proof construction. Whole unit is constructed over a drainage tray to avoid spillage of water out of tank. Rubber corks are provided over rinsing tray to avoid chipping of bottles. ss tank with sink: brushing and rinsing units are fitted on the ss tank. Waste water is stored or can be drained out by using sink. The whole structure is made out of 16 gauge ss. motor drive: 1hp, single phase. output: up to 30 bottles with 2head, 1 rinsing unit.